A long-hilted spear with a barbed point. Long reach, and can be used with shield up. and it is easily blocked by shields. There are two forks in the Graveyard. This item is found to the right of the first fork, guarded by a Giant Skeleton. RB: Quick spear stabs, good range, with little horizontal spread, although they are more than capable of hitting two side-by-side enemies, and can very easily hit two lined up enemies. 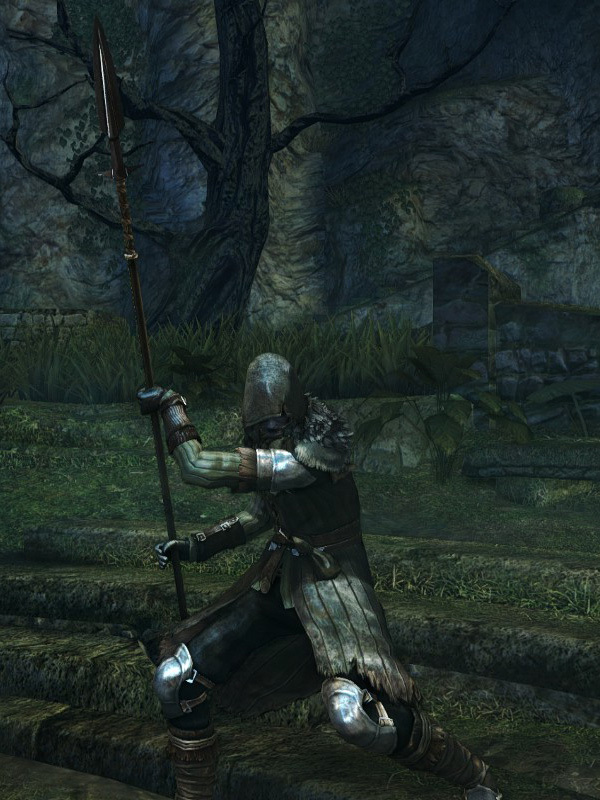 Note that you can also opt to stab while keeping your shield up in a phalanx-style technique. This will drain stamina quickly but it's good to have. RT: Holding the spear lower down the haft, you thrust it far forward. Great range, but very slow. Learn the range for this because whiffing will hurt! RB: Simple two handed thrust. Good range and damage. RT: Huge two-handed lunge thrust. Great range and damage. Jumping Attack: A graceful jump and thrust. One of the longest range melee attacks you can do. Useful for things you don't want to get anywhere near, like curse-breathing frogs. Winged Spear durability reduced to 14. Base damage increased. Cannot repair weapon (except through reinforcement). 1. when two handing this weapon, only 9 Strength is required.